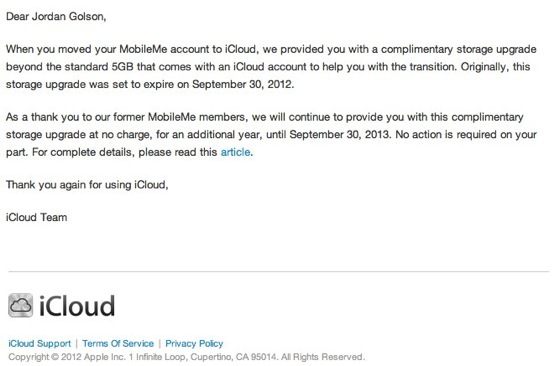 Last year, when MobileMe transitioned from a pay-service to the the free iCloud, Apple gave an additional 20 GB of storage to former MobileMe subscribers as a thank you. The bonus storage beyond the standard 5 GB included free of charge with iCloud was supposed to be downgraded at the end of September, but in an email today, Apple said it extended the complimentary storage for an additional year, to September 30, 2013. When you moved your MobileMe account to iCloud, we provided you with a complimentary storage upgrade beyond the standard 5GB that comes with an iCloud account to help you with the transition. Originally, this storage upgrade was set to expire on September 30, 2012. As a thank you to our former MobileMe members, we will continue to provide you with this complimentary storage upgrade at no charge, for an additional year, until September 30, 2013. No action is required on your part. For complete details, please read this article. Apple notes that users received either 10 GB, 20 GB, or 50 GB of additional storage -- on top of iCloud's standard 5 GB -- depending on the amount of MobileMe storage the user was paying for when the service transitioned to iCloud. Apple offer something for free, and people complain. Our cloud engineers couldn't figure out how to do the migration correctly, so since it doesn't really cost us much, keep it for another year. It sure beats listening to everyone freak out when we delete all your data, instead of just the extra stuff. should get at least 5gbs per iOS device you own/use! Exactly! Since Apple devices come at a premium cost, 5 gb per device seems really reasonable. As it is, I can backup only my iPhone or my iPad to the cloud, but not both because that would exceed the 5 gb limit. If I were to buy an additional iDevice, I'd be out of luck for that one too. Apple keeps track of how many devices are registered to your Apple ID; it couldn't be hard to link storage to the device ID as well as the Apple ID. I've not got a clue how to really use that space, I want my old iDisk. Now please bring back iDisk and My Gallery. I will gladly pay for it as I have in the past. Wonderful! Now I get another year of "24.92 GB of 25 GB available". Thank you for this precious gift, Apple. I don't want any backups on iCloud, I don't want my photos as a goddamn "photo stream" on iCloud, my Numbers and Pages docs on iCloud will never take up more than a puny fraction of that space, and it'll be 20 years before my email takes up 20+ GB... I just want regular online storage with files accessible from all my computers. So I guess I'll continue using my combo of SkyDrive, Google Drive and DropBox and leave iCloud virtually empty. Because nothing makes more sense than having an Apple-only machine park synced to an Apple cloud service and then having to employ everyone except Apple for the cloud services I need.